They do not scream from the shelf, but blend into the quiet scheme that makes the library the rest cure of a home. 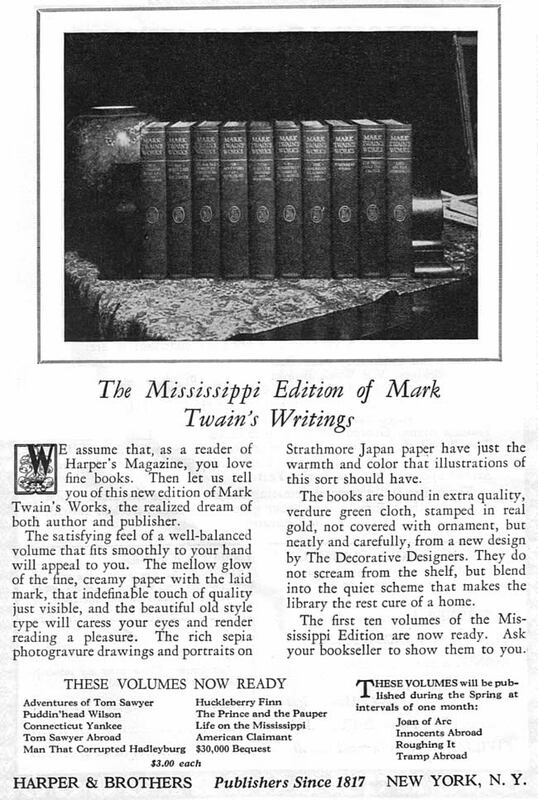 The Harper and Brothers Mississippi Edition of Mark Twain's works was introduced during the fall of 1923, in time for the holiday buying season. One of the earliest ads for the edition appeared November 25, 1923 in The New York Times. The books were not sold via subscription, but through established book stores. Projections were that the set would eventually contain 30 volumes priced at $3 each. 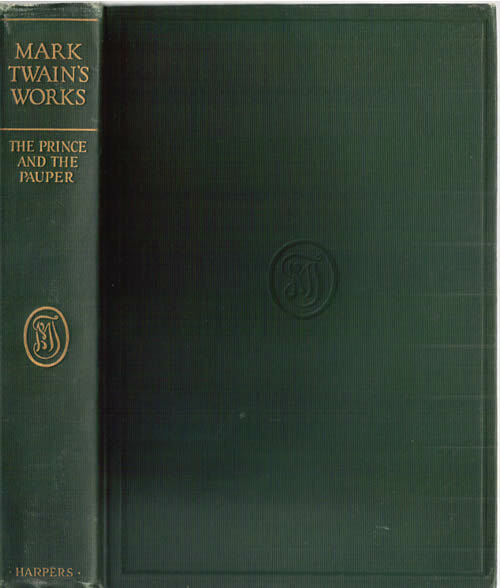 The Mississippi Edition edition is printed on Strathmore Japan paper, bound in green cloth and stamped in gold with an MT monogram designed by a team referred to as The Decorative Designers. The MT monogram appears on the spine in gold and on the front cover in blind stamping. The top edges are gilt and the side and bottoms are deckled. The books were issued in paper dust jackets of pale green with dark green print on the spines matching the gilt titles on the binding. Advertising for the edition was aimed toward the middle class book buyers who could afford higher quality books in distinctive bindings. The price per volume of $3 would equal about $38 in year 2011. 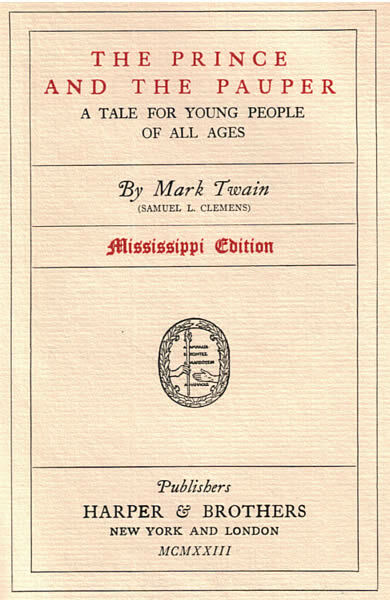 The Mississippi Edition title page features the identical steamboat ornament that appears in the Gabriel Wells Definitive Edition. The copyright page features titles and the name of the edition in red. The first volumes released were those titles that had not been previously divided into two volumes. The volumes were not numbered and were advertised at $3 each making it possible for buyers to pick and choose only one or a few titles at a time. The Innocents Abroad, The Gilded Age, Personal Recollections of Joan of Arc, Roughing It, A Tramp Abroad and Following the Equator had been divided into two volumes in previous uniform editions since 1899. In the Mississippi Edition these titles are printed on thinner paper, recombined and bound together into one book featuring two parts. Harper proposed publishing one title a month throughout the spring of 1924. By October 1924 Harper was advertising twenty titles in the Mississippi Edition. 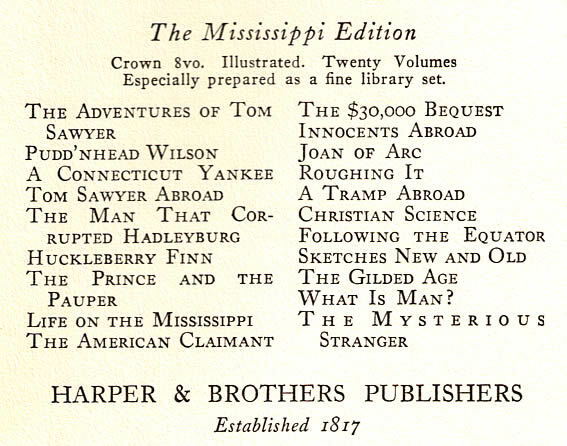 Although Harper and Brothers first proposed an edition of 30 volumes, the Mississippi Edition apparently never grew to more than 22 volumes. Added to the above advertised list were the titles In Defense of Harriet Shelley, a volume previously titled Literary Essays, which has the same contents as Volume 22 of the Gabriel Wells Definitive Edition. Also added to the above list was Europe and Elsewhere. None of the volumes compiled and edited by Albert Bigelow Paine which had been included in the Gabriel Wells Definitive Edition have been found in Mississippi Edition binding. 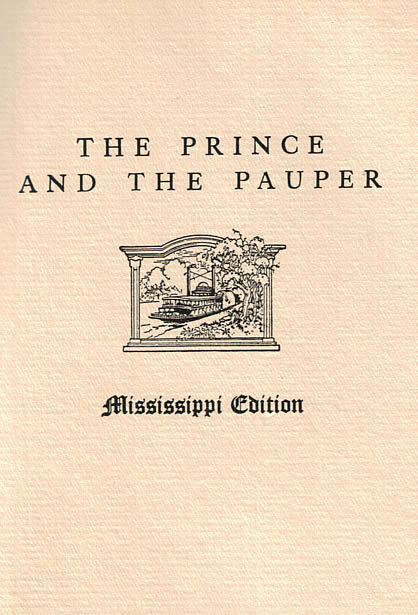 Printing codes in various volumes of the Mississippi Edition indicate that Harper continued to print the edition until at least July 1929. The total sales figures for the edition are unknown. The volumes in the Mississippi Edition feature the same illustrations that appear in the Gabriel Wells Definitive Edition although in most volumes the number of illustrations are reduced, probably in order to reduce publishing costs. The Mississippi Edition is an unautographed and non-limited set that does not feature the Appreciations and Introductions that are a key component of the Gabriel Wells Definitive Edition. There are fewer illustrations in most volumes than in the Wells edition. None of the volumes edited or written by Albert Bigelow Paine have been found in the Mississippi Edition bindings. On the positive side, the Mississippi Edition features cloth bindings and gold stamping that have endured the test of time better than the common blue cloth and tan board bindings of the Gabriel Wells set.